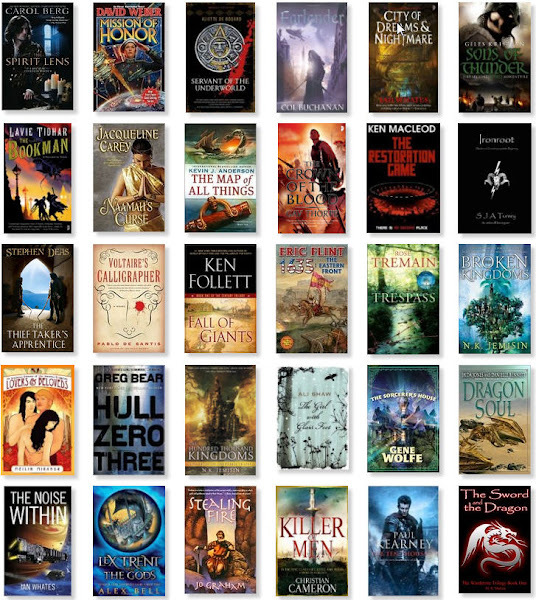 I recently did a cover post with the books read in 2010 up to early December. 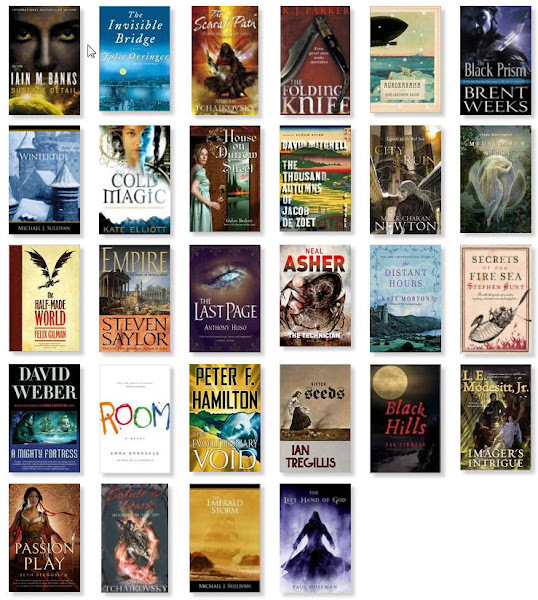 Now I will present my personal list of top 25 novels published in 2010 in ranked order as a collated cover post. For the titles on the list, you can go HERE, while all but one have FBC reviews indexed HERE. I have read some of them in 2009 as advance review copies, so not all will appear in the 'read in 2010' cover collage. Here is the cover collage of 30 more highly recommended books of 2010 with the title list HERE. The order is though random since I do not see any point in making finer distinctions. We have reviews of 27 of them again indexed HERE. This list was a bit more surprising for me since I started with some extra 50 2010 titles I enjoyed and would recommend but I wanted to pare down to the ones that stayed the best in my memory, so I left out some titles I was more enthusiastic on reading them but which faded somewhat as time passed. There are 19 more-or-less fantasy titles, 6 sf titles, 4 historical fiction titles, though here 3 are pure genre and one with literary overtones and a contemporary literary one, so the distribution of the first 28 titles continues. This is no surprise since after all my first criterion is "interesting-ness" in content and that one scales as in "like with like". I always love seeing your best of lists - I've added several to my TBR pile. You always do such a good job organizing from the vast array of choices out there. On behalf of Michael, I would like to thank you for selecting Wintertide and The Emerld Storm. To be considered in such an esteemed list is this is almost beyond comprehension. I'm glad you've found The Riyria Revelations to be an enjoyable use of your time. A lot of these are on my to-read list, and I'm excited to read them. I didn't really like Passion Play so much, though. My compliments. This is the best Best of the Year List I've seen in a while now. Though one might expect such quality from the premiere SF&F reviewer on the blogosphere. Only Niall Alexander and Adam Whitehead come close to your prowess, at least in my humble view. Wow, that was an amazing collection.